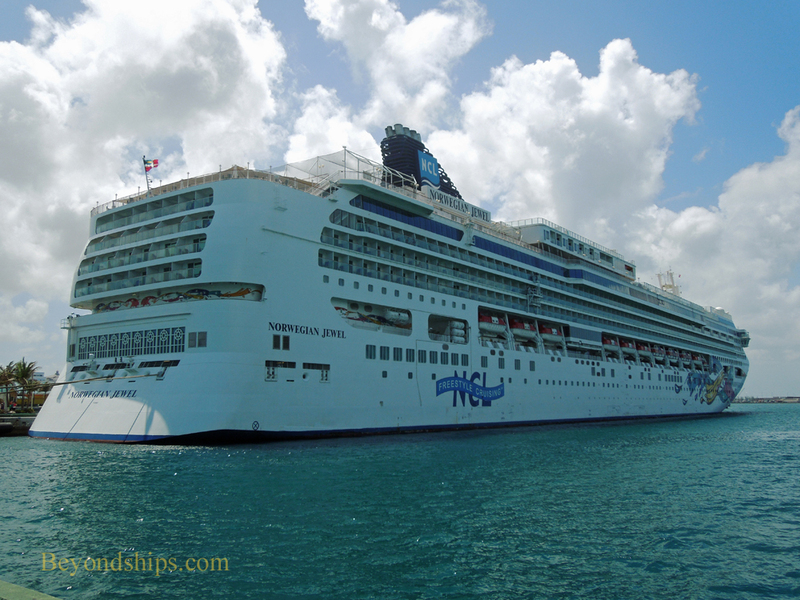 The mainstay of Norwegian Jewel's 2012-2013 schedule was seven day cruises to the Bahamas. These photos show Jewel on one of her last such cruises. For many, Nassau is the highlight of a cruise to the Bahamas. It has the most developed tourist attractions and the most shopping opportunities. An unusually quiet day in Nassau, there was only one other cruise ship, Carnival Fascination, in port with the Jewel. Looking back towards Nassau from Norwegian Jewel as she exits the harbor. Norwegian Cruise Line's private island Great Stirrup Cay was always on the itinerary for Jewel's Bahamas cruises. On this cruise, the weather was fine and so Jewel anchored offshore and tendered her passengers ashore. Next to Great Stirrup Cay is Royal Caribbean's private island Coco Cay. A most unusual sight for passengers on the Jewel was Carnival Fascination tendering its passengers ashore for a day in Coco Cay. (Note: Royal Caribbean and Carnival Cruise Lines are not affiliated).